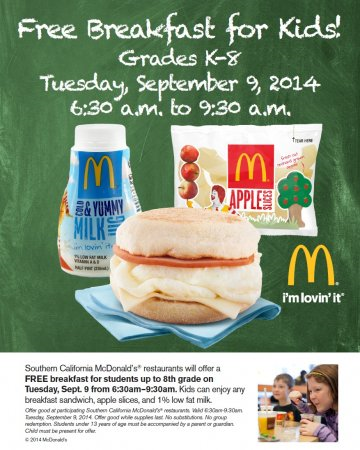 Bring the schoolkids to McDonald’s on Tuesday (September 9) for a free back-to-school breakfast. Between 6:30 and 9:30 a.m., students in kindergarten through eighth grade can get a free breakfast sandwich, apple slices and low fat milk. The offer is available at participating McDonald’s restaurants in San Bernardino, Riverside, Los Angeles, Orange and Ventura counties. McDonald’s restaurants can be found throughout the Inland Empire. This entry was posted in Uncategorized and tagged free stuff by John Plessel. Bookmark the permalink.